Time travel is impossible without near light-speed technology. Yet, we cannot stay away from time travel in literature. Besides magic and immortality, time travel is one of the tropes in science fiction that is the most elusive in real life. There are more than 60 well-known fiction books that feature time travel from the last 30 years. We’ll look at some of the biggest authors on why they incorporated time travel into their work . In 1991, Diana Gabaldon published the first book in the Outlander series and brought Claire Beauchamp from the 1940s to the 1740s via standing stones in Scotland. Claire meets a handsome Highland warrior, Jamie, and their cross-cultural banter is worth a post itself. As the series progresses, Gabaldon devotes more and more of her writing to exactly how the standing stones work and how they continue to impact her character’s lives. In Outlander, traveling through the stones typically takes someone 200 years in the past or future. It is very dangerous, but travelers can use power within gem stones to travel more safely and accurately. It also helps to focus on the person you are trying to travel too. Gabaldon has loved the idea of time travel since she watched Star Trek as a little girl and still revels in the paradoxes time travel presents. In The Outlandish Companion, Gabaldon details her full theory on time travel as well as why she added the component to the book. Gabaldon wasn’t seeking to write a genre-bending book. She began writing historical fiction, but Gabaldon said a British woman just popped up on the page and began making quips about the state of the then-contemporary culture. It was clear Claire was from the future. In the third book in the Harry Potter Series, Harry Potter and the Prisoner of Azkaban published in 1997, time travel is heavily featured. At the beginning of the school year, Harry and Ron wonder how Hermione is able to attend all of her classes as she’s taking as many as possible and even a few that are impossible as they take place at the same time. At the end of the story, it’s revealed that Professor McGonagall helped Hermione get a time-turner from the Ministry of Magic. Hermione and Harry use the time-turner to save Buckbeak and Sirius Black from death. 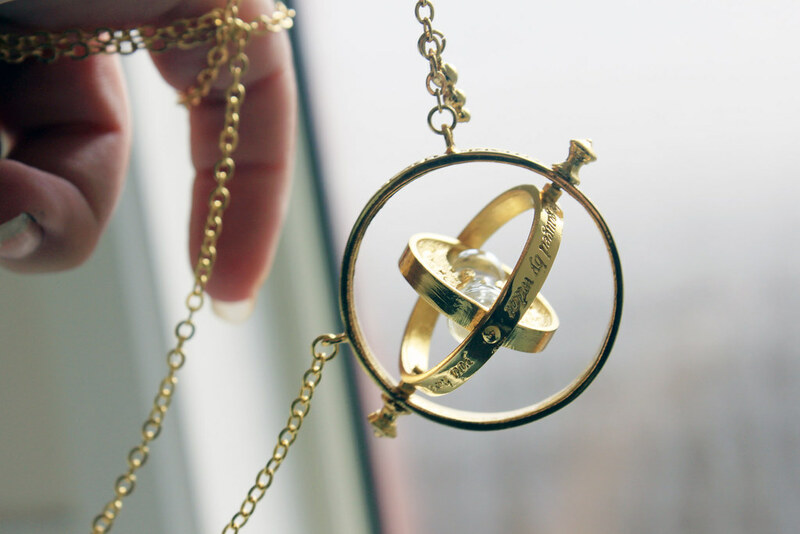 In JK Rowling’s take on time travel, the time-turner is worn around one’s neck and revolved to designate how far back to travel. A time traveler can only travel for up to five hours without facing harm. Time travel is reserved only for trivial matters as using it for greater issues can result in confounding and even deleting the past and present. You can read more on Rowling’s theories on Pottermore. Now, Rowling is surprised she chose to incorporate time travel into her fiction. The time-turner did give her the power to bring The Prisioner of Azkaban to a satisfactory conclusion, but the existence of time travel in the Harry Potter world meant Rowling had to carefully outline how or why time travel was used so it couldn’t easily solve every challenge. For example all of the time-turners were destroyed in the battle of the Department of Mysteries, so Harry was unable to use one to defeat Voldemort. Rowling revisits time travel heavily in Harry Potter and the Cursed Child. “Harry, what do you think you’d do if you saw yourself bursting into Hagrid’s house?” said Hermione. In The Time Traveler’s Wife, published in 2003, Henry, a librarian living in Chicago, time travels spontaneously and with no control over when or for how long. He travels repeatedly to the child who will one day become his wife, Claire. When they meet in the present, as adults and the first time for Henry on his own timeline, Claire knows everything about Henry and he is the one to be surprised. In the novel, time travel is a genetic disorder called Chrono-Displacement. Henry likens it to epilepsy. He travels most to events that have a strong influence on his life. He very rarely travels to the future. When Henry travels, only his body transports; he has no ability to bring clothing or anything with him. A gene therapist is able to replicate the ability in mice. Niffeneger is an artist and when she got the idea for the premise, she knew she wouldn’t be able to play it out in a work of art because of the difficultly of representing the passage of time. She knew it had to be a book. Niffeneger originally structured the story by theme, but decided to base the timeline around Claire’s life for continuity. Niffeneger is writing a sequel focused on Henry and Claire’s daughter, Alba, who also has Chrono-Displacement. Stephen King’s novel 11/22/63 was published in 2011. In it, a high school English teacher named Jake becomes friends with the owner of a local diner. Jake is shocked when his friend suddenly ages, the result of living in the past, accessible via a portal in the diner’s pantry. Jake decides to live in the past until he can prevent the assassination of John F. Kennedy in 1963. After his mission, Jake returns to the future and he discovers it was a cost to the world so great, he must return and thwart himself. Time travel though the portal follows several rules. It takes travelers to 11:58 AM on September 9, 1958 and only two minutes elapse when the traveler returns to the present. Travelers are able to change the past, but small changes have a huge butterfly effect. King first got the idea for the novel in 1971, but knew it would require a lot of research because of the historical fiction elements and decided to wait on the idea. King and his researcher Russ Dorr prepared by reviewing newspapers and recording daily life trivia, like the cost of a haircut, to increase the realism of the story. In King’s version of time travel, every time something in the past is changed, it creates an alternative timeline and damages the time-space continuum. The Rise and Fall of D.O.D.O. by Neal Stephenson. What’s your favorite time travel novel? Would you travel in time if possible? Photo credits to @QuillofSpirit & @thePootPhotographer on Unsplash.com.